Last week we discussed some of the best dog training methods, but we also get asked about what dog training methods should be avoided. A well trained dog is happier and safer, but also easier to keep healthy, because he or she will be easier to handle when its time for regular parasite control or a visit to the vet. Unfortunately a poorly trained dog can be a danger to himself and others, so bad dog training techniques should be avoided. There are various levels of bad dog training, but the worst are those that use physical abuse or punishment. This is both cruel and ineffective, and so you should never allow anyone to try and use these sorts of methods with your dog. The goal of dog obedience training is to establish a positive, loving relationship with your dog so physical punishment is NOT how to do it. 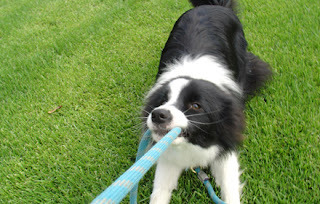 Another dog training method to avoid is having only one person in the household taking responsibility for training the dog, either because they think they should be the only one training the dog, or because no one else wants to train the dog. If you have a multi-person household and are serious about training your dog then this just doesn't work. If only one person has responsibility for training a dog, no matter how great their training skills are, this makes it hard for the dog to listen to everybody else. The dog will realize that it needs to behave around one person, but know or think it can get away with bad doggy behaviour in front of the others. A good example of this is when dogs jump on people. This is not good dog behavior and one person could be training them to stop this but at the same time, someone else in the house thinks it’s cute and rewards them with attention. Another bad dog training method is having no method at all, and just "following your gut". Unfortunately dogs are complex animals and sometimes you may inadvertantly be re-inforcing bad behaviour. There are lots of great dog training books and DVDs available, so if you plan to train your dog yourself find one that suits you and follow it. As well as bad dog training methods, there are dozens of other dog training approaches that don’t work or don't work well. If this is your first dog, get advice from friends with dogs about what has worked for them, and of course, don't be afraid to ask your vet which method she recommends.